Ebi Fry Ramen is now at Hajime! They heard you: Ebi Fry Ramen is now a reality at Hajime! You asked, and Hajime heard your calls for a new dish! Ebi Fry Ramen is now a reality at Hajime! Chef Tan-san heard your requests, and took some time to do a little R&D of his own to make it perfect. When he was told of your requests for an Ebi Fry Ramen, he was driven by the desire to innovate new and better flavours for food lovers like you. Putting Tonkotsu Broth that’s been simmered for 12-hours with a secret Sakura Ebi Paste that was made in-house, Chef Tan-san has created a stock that goes side-by-side with 2 pieces of his popular Ebi Fry. To give the dish some sweetness, he also added braised loin rib into the ramen. You’ve enjoyed the Ebi Fry, and you’ve tasted Chef’s hearty ramen stock. 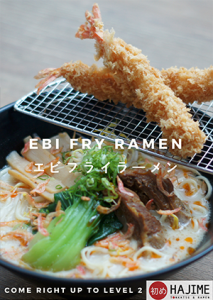 Now, you can have the best of both worlds with the Ebi Fry Ramen, at only $16.90 per bowl. 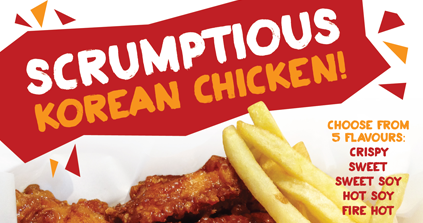 I don’t know about you, but I’m heading down to try it right now!